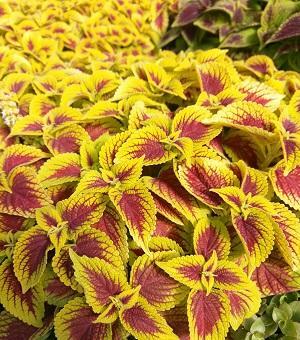 The Defiance Coleus produces vibrant rich red leaves with bright yellow accents acrosses the pointy edges of its leaves. The Coleus has nice dense foliage with a mounding, upright habit. Coleus prefers the shade, but can handle the heat if in partial shade to shade. It is a favorite with landscapers and homeowners. Foliage is a great accent to all shade gardens and landscape. The wide range of colors are so varied that just mixing different Coleus together is striking.